Once upon a time (between 1848 and 1916, to be more precise), Austria was ruled by a little reactionary called Emperor Franz Joseph I who tried to keep his crumbling empire alongside with his own fading power alive. Since Franz Joseph I had become emperor in the course of the general confusion that followed the attempted revolution of 1848, he persecuted liberals and other progressive forces quite aggressively throughout his live. This included that he had massive military bases built all around the first district of Vienna in order to enable his army to kill even more civilians than in 1848 in case of another revolution. The pillars of this strategy were the Franz-Josefs-Kaserne, the Rossauer Kaserne and the Arsenal. The latter one was the biggest institution of its kind and provided facilities for artillery that could fire shells into Vienna′s city centre. Today, only a small section of the arsenal still serves for military purposes anymore, much more of the site houses the museum of military history (Heeresgeschichtliches Museum). The building itself is rather enormous and consists of red bricks. It is generally considered to be among the most important buildings of the Viennese historicism that dominates the buildings of the Ringstraße. The construction started right after the defeat of the revolution in 1849 and was finished after a relatively short amount of time in 1856. By then, the official reason for the construction was the defence of Vienna towards the outside - which is utterly ridiculous, as the brick construction is totally unsuitable for standing artillery fire, yet perfect for securing the city against badly trained and equipped revolutionaries. The huge construction site was spit into sectors that were under the control of different architects. The most important one was Theophil Hansen, who also built the Houses of Parliament, the Academy of Fine Arts and the Künstlerhaus Wien - alongside with many other buildings of the Ringstraße. 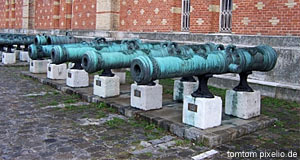 Generally, the style of the Arsenal resembles fortresses of the Italian Renaissance with elements of Byzantine and Moorish fortress traditions. The Heeresgeschichtliche Museum was opened in 1891. The Arsenal served as an army base and an ammunition factory during both World Wars and was seriously damaged by bombs in WWII. This war also added a massive FLAK tower, a huge chunk of concrete and steel from where allied planes were taken under fire. After the end of the war, the arsenal was re-built in its original outlay and extended in the following decades. Between 1959 and 1963, the workshops of the federal theatres (Bundestheater) moved in, later offices and technology support for the Austrian mailing and telecommunication services. Since the 1990ies, the Burgtheater uses parts of the arsenal for rehearsals. A small part of the site is still in use as an army base. The Heeresgeschichtliches Museum has the usual array of items that every capital of current or former empires has - planes, tanks, plates and dioramas. With a regional focus on the Austrian-Hungarian period, including the navy (at its time the biggest fleet in the Mediterranean) and other details that might surprise the naïve visitor of Austria. The exhibition starts with a "Hall of Fame" with early Austrian military heroes and continues chronologically. Starting with the 30-Years′-War and the Turkish Wars, it continues with the Napoleonic Wars, the Austrian-Prussian War and the two World Wars. At latest by then you will realise that Austria was involved in a lot of warfare, but not necessarily with a great deal of success (apart from the Turkish Wars). You probably have to be interested in either the military, history or both in order to go there in the first place. However, the museum has several items on display that make it a genuinely interesting place even for people with moderate fondness for army history. For example the sofa on which not-quite-democtatic-but-rather-faschist "Chancellor" Engelbert Dollfuß bled to death in 1934 after being shot by Nazi revolutionaries. A similarly macabre exhibit is the Gräf & Stift Automobil car in which Archduke Franz Ferdinand and his wife Sophie were shot in Sarajevo in 1914 - which triggered the outbreak of WWI. The car belonged to the Count of Harrach and his successors tried to sue the Republic of Austria in 2003 in order to get the car back. They failed and so you can still marvel at this crucial vehicle - alongside with Franz Ferdinand′s uniform jacket, in which you can still see the hole from the bullet and the blood stains. The museum is the oldest purpose-built one in Vienna, by the way.